WASHINGTON (CNS) — An organization of 1,200 priests has called for revisions in the way seminarians are prepared for ministry so that the U.S. Catholic Church can better address challenges that include declining membership and falling seminary enrollment. The Association of U.S. Catholic Priests addressed five areas of concern, saying that priests must get closer to the people they serve and better understand what it means to be a disciple of Jesus as envisioned by Pope Francis. The concerns were outlined in a March 29 letter and eight-page document sent to Cardinal Joseph W. Tobin of Newark, New Jersey, chairman of the U.S. Conference of Catholic Bishops’ Committee on Clergy, Consecrated Life and Vocations. The committee, which includes eight other archbishops and bishops, is reviewing the Program for Priestly Formation, the fifth and most recent edition of which was published in 2006. The committee is expected to submit revisions for a new edition of the guide at the November 2019 USCCB fall general assembly. The committee’s work partly comes in response to the December 2016 release by the Vatican Congregation for Clergy of “The Gift of Priestly Vocation,” a detailed set of guidelines and norms for Latin-rite priestly formation. The new guidelines and norms also ensure continuing education, training and support for priests. The AUSCP represents a minority of the total number of U.S. priests. Overall, there are 37,959 priests, according to the 2017 edition of the Official Catholic Directory. 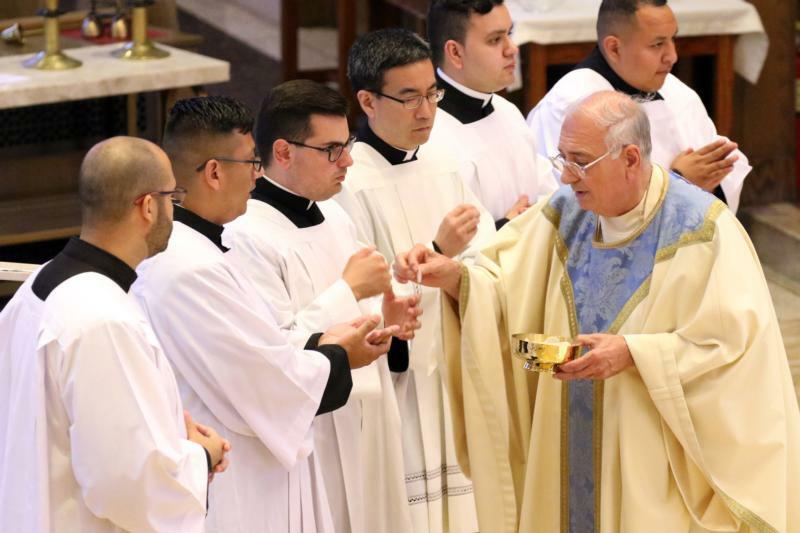 “Over the years, I’ve gotten more and more concerned of the distance that exists between priests and people,” said Father Ronald C. Chochol, a retired priest in the Archdiocese of St. Louis and chairman of the AUSCP’s Working Group on Priestly Formation. He added that the organization’s members have become increasingly concerned that the church has not adequately addressed a series of challenges that have emerged in recent decades because priests are not as closely connected with their parishioners. “The issue is maybe this system, this model (of formation) is not adequate to the present,” Father Chochol told Catholic News Service. “The issue is for all of us. It’s not just for priests. We know how crucial the role of priest is to the church. It’s time to step back and see what’s being called for,” he said. The working group’s report also questioned the current seminary model used to train priests. Among the organization’s recommendations was a plan to have seminarians live in parishes while they complete their studies so they can better understand the lives of people they will eventually serve. The working group emerged from the organization’s annual meeting in June in Atlanta. There, those in attendance decided that formation was a top priority to address. Working group members included eight senior priests, with all but one ordained during or within a decade of the Second Vatican Council, which was convened from 1962 through 1965. Father Chochol told CNS that the organization’s membership felt it was important to stress that the “pastoral values” of Vatican II be “consistently and persistently affirmed” in the revised Program of Priestly Formation. The working group called on the USCCB committee to consult with laypeople, “who are affected by the priests our seminaries educate,” as they review formation practices. Father Chochol said the organization planned to promote its document among priests in the hope of gaining a broad backing.